No Phantom Forum in this issue. 4th daily newspaper story; 20 Sep 1937 - 5 Feb 1938. Previous Frew appearances: 176, 284, 429, 597, 802, 931A. 5th daily newspaper story; 7 Feb - 18 Jun 1938. Previous Frew appearances: 21/22, 122, 227/228, 931A. 6th daily newspaper story; 20 Jun - 23 Jul 1938. Previous Frew appearances: 16, 221/222, 350/380, 540, 721, 931A. 7th daily newspaper story; 25 Jul - 5 Nov 1938. Previous Frew appearance: 12, 119, 209, 331, 487, 669, 884, 932. 9th daily newspaper story; 30 Jan - 6 May 1939. Previous Frew appearance: 1, 98, 146, 249, 386, 542, 723, 933. 10th daily newspaper story; 8 May - 2 Sep 1939. Previous Frew appearance: 17/18, 150, 254, 393, 550, 734, 936. 11th daily newspaper story; 4 Sep 1939 - 20 Jan 1940. Previous Frew appearance: 13-15, 108, 198, 309, 458, 740, 934. Welcome to the Year 2000! From Frew's point of view, what better way to start such an exciting New Year than with the publication of a very special issue? The Year 2000 Annual Special is not only the 10th in our Blockbuster series, but for the first time in Frew's long history, the contents of this edition have been chosen by our loyal readers! Elsewhere in these pages, we explain the results of our reader poll and how we ended up using seven of the top ten nominated Lee Falk stories. The remarkable thing about our reader poll was the heavy leaning towards selection of classic stories from the late 1930s. While we placed advance orders for a heavy swag of old stories in anticipation of some being voted into the top ten, we gambled on at least a few from the 1960s and 1970s making the cut and obtained repros of many adventures from those eras. Not one made the top ten! However, we now have a huge file of material which will be put to good use in the future. Covers for this 10th Special were commissioned from Antonio Lemos and as usual, our former commercial artist from Uruguay, has created some beautiful art. Thanks are now due to all the Phantom enthusiasts who submitted their top ten story lists. We are sorry we could not include all stories nominated, but know everybody will understand that was in the Mission Impossible category. 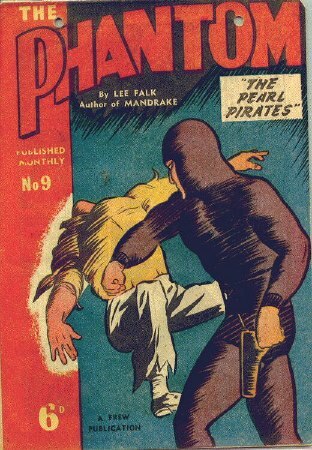 Just for the record, no less than 54 of Lee Falk's Phantom adventures appeared in more than 1200 top ten lists! Obviously, this Year 2000 Special is destined to become a prized collector's issue. Already emerging on the market are complete sets of all of our Phantom Special Editions and this tenth publication will almost certainly achieve the same level of collectability as the now almost impossible to find 1000th issue published in 1991. Just for the record, all nine of the previously published Annual Specials have become established as comic collector's items and apart from the first (the 1000th issue), the 1994 and 1995 Specials especially (respectively, The Golden Age Special and the Lee Falk Tribute Issue) have become really hot items. 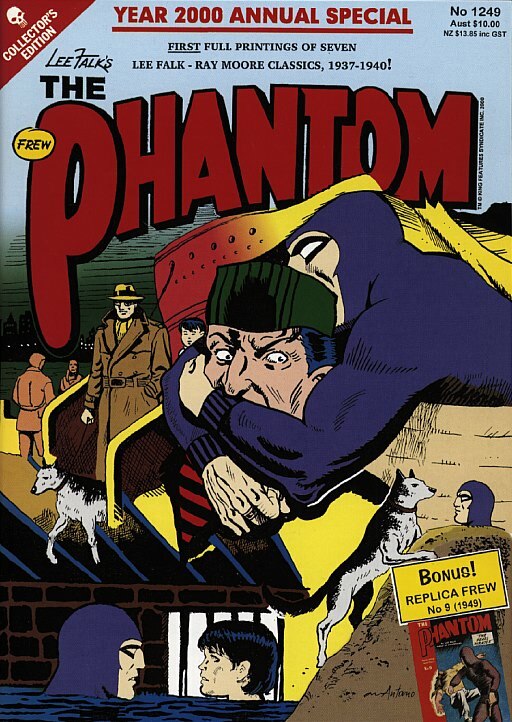 Lee Falk's The Phantom character has now been in existence for an astonishing 65 years, give or take a few weeks as you read this Message. It is nothing short of amazing that the popularity of The Ghost Who Walks remains so high in Australia. Assuming the comics art form is not one day engulfed by the electronics age (perish the thought! ), there seems little reason to even begin to believe that The Phantom will not be around to entertain and educate the true believers in 20, 30 or even 50 years time. Just think what fun the historians from so many fields of study will have in the future as they attempt to unravel the mysteries of the world-wide appeal of the Phantom! In 50 years time there will be some 2820-odd Frew editions to wade through and ponder over!